ser•en•dip•i•ty n. Happy good fortune, brought on fortuitously. 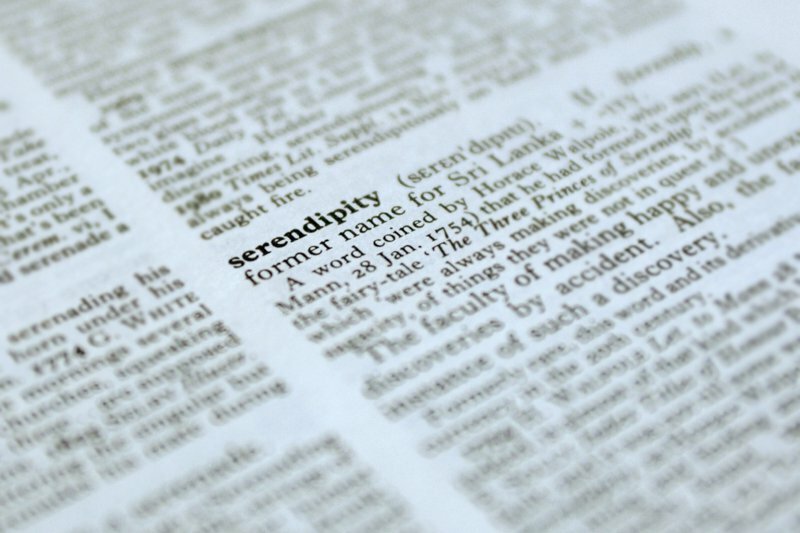 In a letter dated January 28, 1754, Horace Walpole mentioned a discovery "of that kind which I call Serendipity," a word the author says he derived from "The Three Princes of Serendip," a fairy tale in which the title characters "were always making discoveries, by accidents and sagacity, of things which they were not in quest of." The story opens with the King of Serendip casting his three book-smart sons out of his island domain so that they may gain worldly experience. In their travels they come across a disturbed stretch of empty road littered with clues from which they deduce the following: A lame camel who is blind in one eye and missing a tooth passed by carrying a pregnant woman and saddle packs of honey and butter. The princes are later suspected of stealing the camel and taken to wise King Behramo, who asks them how they could know so much about a beast they claim never to have seen. The camel's lameness, they say, is evidenced by a dragged hoofprint; the one-eyedness, from grass having been eaten on but one side of the road; from gaps left in said grass, the missing tooth; the honey and butter from a trail of flies and ants; and the pregnant woman from a handprint (don't ask) and a good sniff of urine where she had relieved herself (really don't ask). Having obviously found some sharp (if weird) dudes, Behramo adds the princes to his court and they go on to have various amusing adventures. The tale that Walpole read had been translated into English from the French rendering of a 1557 Venetian book, Peregrinaggio di tre giovani figliuoli del re di Serendippo by Christoforo Armeno, an Armenian who had adapted it from a circa-1300 Persian story. That tale, in turn, relates to an entire genre of Persian literature centered around Bahram V — King Berhamo — who ruled the Sassanid empire of Persia in the fifth century. Though not an especially distinguished king, Bahram was handsome and athletic and enjoyed the good fortune of reigning over a golden age. Persian poets spun tales of him for a thousand years, embellishing Bahram's meager accomplishments with old legends, including the one about the camel, which had been recounted in the Talmud (among other places) before Bahram V had even been born. The mellifluous Serendip was the ancient Persian name for Sri Lanka, a faraway and exotic isle. Serendip was hugely important in the spice trade, being the land of cinnamon, formerly among the most precious of commodities. Serendip's location had long been hidden from Westerners, who took as fact another fairy tale, that of the Cinnamon bird, described by Herodotus as an enormous beast that collected cinnamon sticks from some undiscovered land in order to build its nests; the high cost of cinnamon owed to the difficulty in harvesting these nests. Eventually Serendip and its cinnamon passed into Portuguese, Dutch, and finally English hands, gaining another name, Ceylon, and being carved up into plantations for other tropical crops such as indigo, chocolate, rubber, and tea, as those who enjoy a cup of Ceylon may already know. This entry is excerpted from , by John Bemelmans Marciano, and is reprinted here with permission. John is a New York Times best-selling author-illustrator of books for both kids and adults. He travels for the differences. Этот авторитетный сайт на тематику уборка торговых центров.